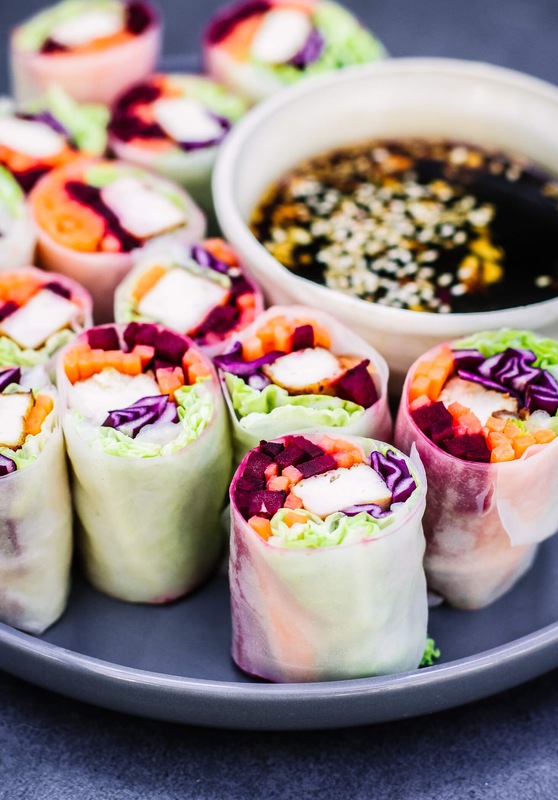 These Tofu Fresh Rolls have the best crunch that makes them so satisfying. The tofu gives them a protein boost and it’s quickly marinated for loads of flavour. You can use any crunchy veg but I think carrots are a must. They work really well in lunch boxes if you want to make them the night before and they’re great finger food for sharing. To start, whisk together the tamari and coconut sugar and pour it into a small dish. Slice the tofu into brick shapes about an inch thick. Lay them in the dish to marinade while you prep the veg. Peel and slice the carrots and beetroot into matchsticks. I use a julienne peeler to do this. thinly slice the red cabbage and rip the chinese cabbage leaves into halves/quarters. Drizzle a little sesame oil into a pan on medium high heat. Cook the tofu for about 2 minutes each side until golden and crisp. Set it aside to cool. Whisk together all of the sauce ingredients and pour it into your serving dish. I sprinkle over some toasted sesame seeds too. Pour warm water into a large shallow bowl. Add a rice paper sheet and let it sit for about 10-15 seconds until it’s starting to soften and be pliable. Set it out on a flat, clean service and let it absorb the excess water and soften further. When it’s basically dry, lay the vegetables and tofu in a strip about an inch from the edge closest to you and an inch from the sides. Fold the sides over until they reaches the veg. Then tightly roll it. Slice into two or three and repeat with the rest. 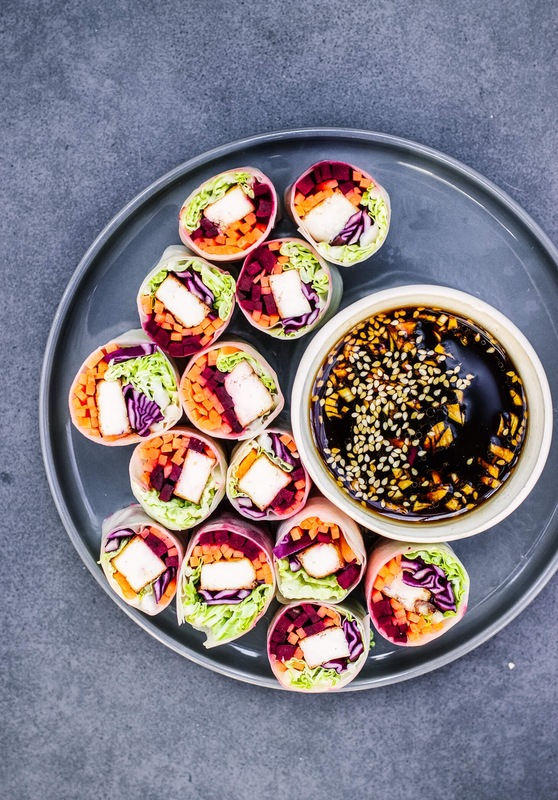 Would love to know where you pick up your rice paper sheets? Are these handy enough to find in shops in Dublin? Have cooked many things from this website and from your book. I have to say these were exceptional!! Both muself and the hubby found them to be full of flavour, quick and easy mid week dinner. Thank you!